I'm heading to Glastonbury next week (yay!) and I've been thinking about what to pack. 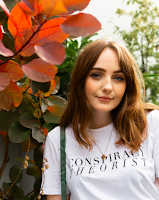 I actually filmed a video a few years ago about what to pack to Leeds festival (excuse my video voice and bindi purchase) but I feel like things have definitely changed, especially in the beauty stakes. I still stand firm on the idea of not taking your entire makeup collection to a festival, because really, who can be arsed with that? But it's important to feel good in yourself and a little glitter never hurt anybody, right? Ideally you should take miniature versions of things to festivals, because it's just more convenient, but as far as I know Kiehl's don't make a smaller version of my favourite moisturiser from the blue herbal range, so the full size version is coming with me. Moisturiser is a step that cannot be skipped, remember that. All that sunshine (we hope) and alcohol does not help keep your skin soft and smooth, so give it a little helping hand. Another essential step: SPF. I can't stress this enough, wear your SPF! This is a whole thing I'll go into in more detail soon, but if you're spending all day outdoors, no matter sunshine or rain, you will need an SPF, and the higher the protection the better. It's all about the vaseline. Or whichever lip balm you prefer. Again, being outdoors all day, your lips can get dry, sore and even burned, so make sure to lash a tin of this in your bumbag. I'm not a massive fan of wearing lipsticks at festivals, especially as mirrors are hard to come by and you'd be better off enjoying the music than reapplying lipstick every ten minutes, but I might take my Kat Von D everlasting lipstick because it lasts hours and hours. It really is worth the hype, but why must it be so hard to come by in the UK? Side note: take a pocket mirror. Concealer is an obvious one really, it covers dark circles from when you've been partying until 4am and can disguise even the heaviest of hangovers. I swear by Collection's lasting perfection concealer, it's great for under eyes and covering those pesky spots. 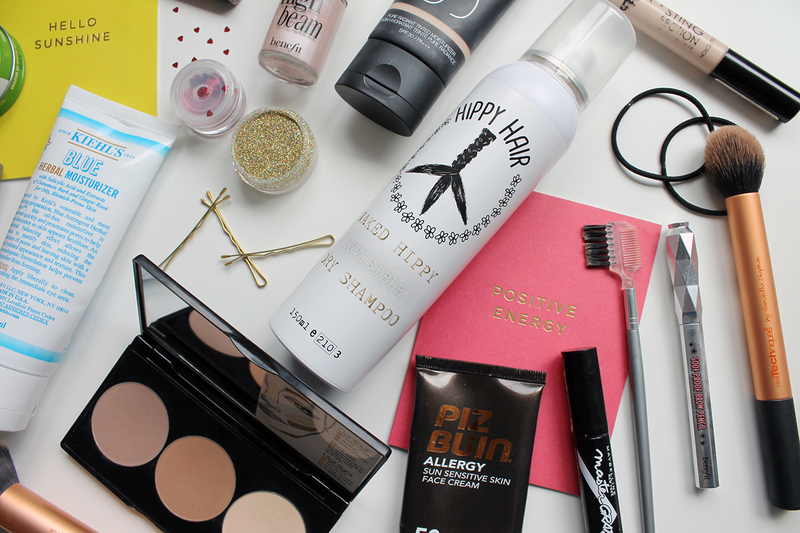 Some might say foundation is not a festival essential, but some of us like a little more coverage. I've recently tried NARS' pure radiant tinted moisturiser for days when I don't want a full on face but need that extra something. This is especially great for warm weather too, fingers crossed we get some! 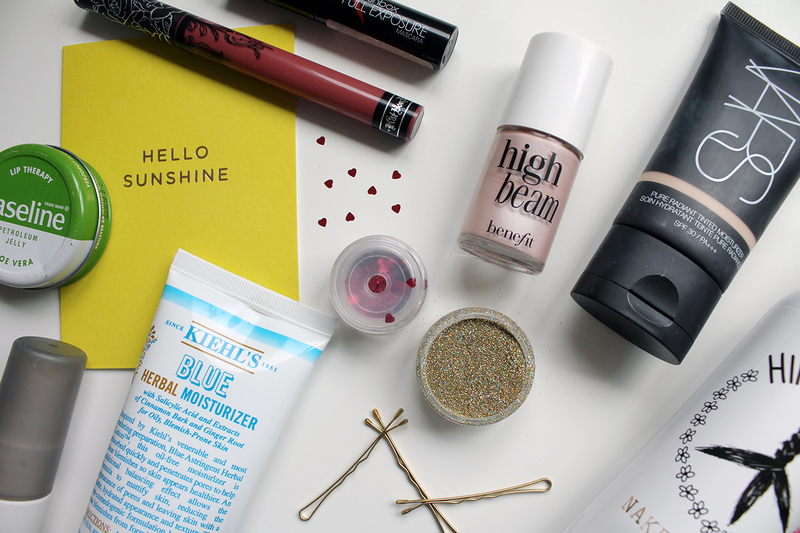 Again, highlighter isn't exactly a festival essential but it can really make a difference to your look. I'm currently using up my last bottle of high beam but I'm desperate to get my hands on Urban Decay's naked illuminator, it's just so sparkly! At least with this being liquid I won't have to worry about it cracking and making everything else in my makeup bag sparkle. Okay, another non-essential, but for those of us with a bit of a moon face, a little contouring goes a long way. I definitely won't be putting all my effort into finely crafted lines to sculpt those cheekbones whilst sitting in my tent, but this handy Smashbox palette is easy to pack and suitable for both day and night. If you ask me, setting spray is definitely worth the investment. I actually use Urban Decay's all nighter setting spray on a daily basis, but when travelling to Milan (more on that here) I needed a smaller size for my hand luggage. They only had their de-slick spray in stock at the time, so I picked it up. It's great for sweaty weather and really does keep everything in place, so it saves you making several trips back to your tent for a touch up. I certainly won't be taking my full set of brushes to Glastonbury, but narrowing it down to a select few I know I can't live without. I use the Real Techniques buffing brush for foundation, or in this case, tinted moisturiser, and the contour brush obviously for contour. 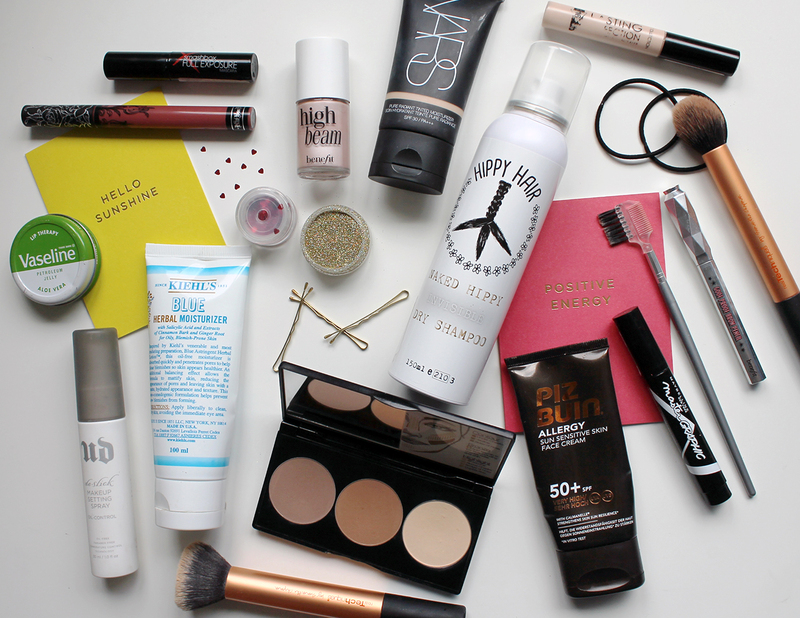 Depending on which products you take with you, chances are you won't need the full set for the weekend. I play around with my brows a fair bit compared to the rest of my face, and after buying Elle earlier this month (purely for this reason), I got a sample of Benefit's new goof proof brow pencil. I was a little wary at first, usually preferring powder, but this isn't half bad. I don't know if I'm converted for life, but it's certainly more convenient to apply than powder and wax, so convenience wins here. In my bag I'm taking to Glastonbury you'll find a naked hippy. That's Hippy Club's invisible dry shampoo fyi. Dry shampoo is a seriously obvious festival essential, but have you ever been caught in the rain after giving your roots a spritz? Hello white chalky hair. Not with this baby though, it's the only dry shampoo I use now. Of course bobbles and kirby grips are a must, with braids being possibly the most popular festival 'do this year. As I said, a little glitter never hurt anybody. We've all seen the glitter roots trend doing the rounds on Pinterest and a festival is the perfect time to give it a go. I might even sprinkle some under my eyes to go the extra mile to cover those dark circles. Normally I go all out on the eyes, with my Naked 3 palette a permanent fixture on my face, but to be honest I'd rather be spending my time discovering new bands than blending away at my eyelid. Instead, I'll just be taking a felt eyeliner. I'm currently using this baby from Maybeline but I'm open to suggestions on similar liners, so if you have any ideas comment below! Of course my mascara is coming with me. This is a little mini version of Smashbox's full exposure, my current fave for daytime looks. Fyi, for removing all of this, my top recommendation would be Garnier's micellar water and a couple of cotton pads, maybe with a decent cleanser if you have the room, but remember you won't be able to do this easily in your tent, so maybe leave the 12-step night time routine at home and treat your skin once you get back. Disclaimer: Those of you who might have creeped on my Twitter will know I work for Hippy Club, but this post wasn't sponsored, I just genuinely love this dry shampoo and want everyone to know how great it is. I need to buy a new highlighter ASAP and high beam has such a beautiful color! Love this post, so many useful hints and tips! Thanks for sharing.